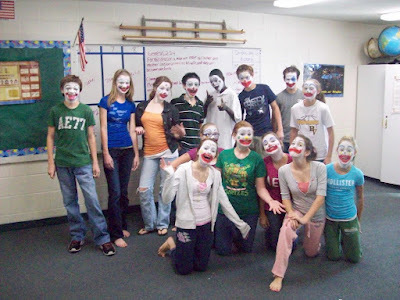 You can see from the above picture and the website slideshow that the 8th graders were clowning around on Saturday! Many thanks to Miss Rachel McLaughlin and our helpers for showing them how to apply their clown faces. Mrs. Mitchell did another great job leading them through the practices on their skits! Miss McLaughlin remarked on how well this group did today compared to others. So we are off to a great start - still more work to be done. We have a music group we would like to prepare, and Mrs. Gulbronson will be working on that area. Mr. Mitchell will be working with puppeteers. April 1-7, 2009 - Missions trip 2009! !